Last weekend was cold and rainy. Typical spring Chicago weather, 80s in the week then down to the 50s as rain and a cold front moved through. I had just turned the thermostat over to AC so go ahead and blame me for jinxing it. Sunday dinner required something hot and warming to chase away the chill. Duck stew fit right in. I cannot lie, I fully intended on roasting the duck when I took it out of the freezer. But something about the weather just made me want a stew. There’s a recipe in Mario Batali’s Simple Italian Food for Duck Stew Foggia Style which I’ve always wanted to make so I took a look at it to see if it would work. The only ingredient I actually had on hand was the duck but the technique of cutting the duck up into pieces gave me the starting point I needed. From there it was simply an exercise in putting flavors together. This stew really came together from a lot of little things I happened to have laying around. An apple sitting on the counter, some carrots, some bacon ends I had in the fridge, and orange thyme from the backyard gave it some really excellent layers of flavor. The duck did too. These are much more fall flavors than spring but I really don’t care. It was warm and delicious, rich but not heavy, with a subtle sweetness to it. 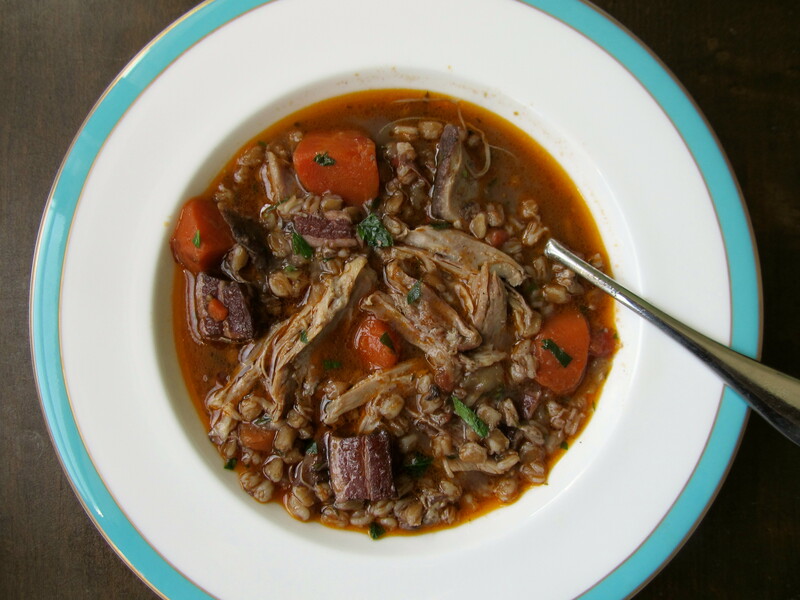 One thing I always seem to do when adding rice, pasta, or in this case farro, to soups and stews is panic and add more than I should. For example, I added one cup of farro but it just didn’t look like enough so I ended up adding another. Well, I don’t think I need to tell you that extra cup really sucked up the liquid and I had to add some more water in order to get it back to being a stew! I reverted back to one cup for the recipe but you might be able to get away with another ½ cup of farro, just adjust your liquid accordingly and keep an eye on it. Season duck pieces with salt, dust with allspice and fennel pollen. In a large heavy bottomed Dutch oven brown the duck, skin-side down. This will take a little while, let the fat render out, around 10 mins. Remove and set aside. Drain off excess fat (reserve for potatoes! ), deglaze the pot with some wine (from the open bottle you’re now drinking from). Add lardons, shallots, carrots, and apple. Cook for 4-5 mins, stirring occasionally. Add the water and wine, and bundle of thyme. Bring to boil. Add duck and juices back in, bring back to boil. Cover, reduce heat to simmer and cook for 60 minutes. After 60 minutes stir in the farro, and continue simmering until tender, about 30 more minutes. Finish with chopped parsley and serve. I can vividly imagine how good the aroma with wine allspice and fennel while simmering. What a creative twist! I am too old school and simply must roast duck saving the fat for potatoes…. I definitely will use this recipe for some shanks I have. Thanks again for the inspiration! You’re welcome! Check out ‘The Flavor Bible.’ It is the BEST resource for pairing ingredients with herbs, vegetables, meats, etc. Hey Pete, Got it and it is really quite novel. The scotch pairings are in my cross hairs! Very enjoyable reading. Thank you for the suggestion! simply damn delicious and comforting stew…. Thank you! It really was perfect for a cold rainy weekend.